Buffer is a great solution for managing your social media activity. With the Buffer Scheduler, you will save hours and still be active on social media to attract more new clients. The Buffer Analytics is an excellent tool to overview the effects of your social media activity and to give insight into your engagement growth. 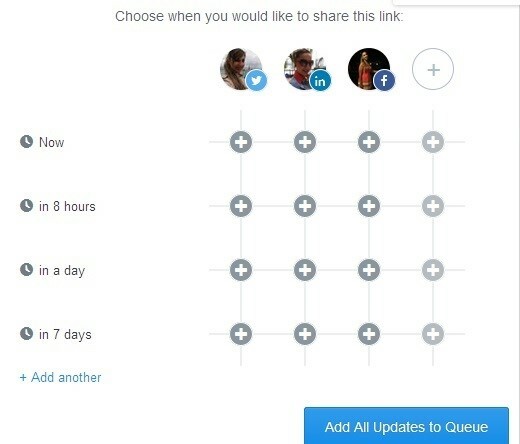 Buffer has a ton of features that we divide into five groups: Social linking, Scheduling, Conversation, Analytics and Additional integration. When it comes to two–way social activity, in Buffer you can’t see the notifications on these social networking sites. Buffer will not tell you about any messages, people who sent you an invitation for friendship, new followers, etc. 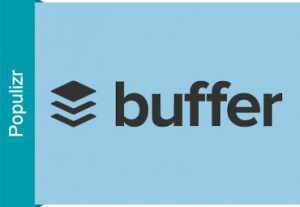 The key benefit of using Buffer is that you can schedule your posts rather than publishing them manually. You can plan the time when you want to publish your post ( photo, video, link…). Buffer helps you reach your audience at the right times, driving more clicks on your posts and traffic to your site. The Buffer Scheduler has a feature called time slots. Time slot allows you to publish your content on your social media profiles daily or only on certain days. You can choose every day at the same time or only certain days at set times. You can also make different schedules for different days. It means that different posting times for each social media account that Buffer links with. Buffer has an Optimal Timing Tool that calculates for you the best time for sharing the content according to your time zone and number of the times you want to publish your posts. It limits to 16 different time periods when you want to publish your content in a day. The scheduling greatly simplifies today’s need to be active on social media. It helps you organize your time the best way possible and it brings you excellent results for some types of marketing with less effort. One of Buffer’s weaknesses is that you can’t communicate with your clients because this platform doesn’t show any comment on your posts. Since there is no possibility of conversation on social media sites directly from the Buffer dashboard, you can’t listen to what your clients say. Which means you can’t form relationships with your audience. Buffer for business offers powerful new analytics to understand better your social impact. It measures the effects of your social media activity that can help you improve your marketing and have new clients. Here, you can see your most or least popular Retweets, Favorites, Replies, Clicks, and Reach. Here you can see how many Posts and Clicks you have per day and how much is your reach, say for the last 30 days. It also shows you the time when publishing of all your posts in that period of 30 days, their Type, the Retweets, Favourites, Mentions, Clicks and Potential. 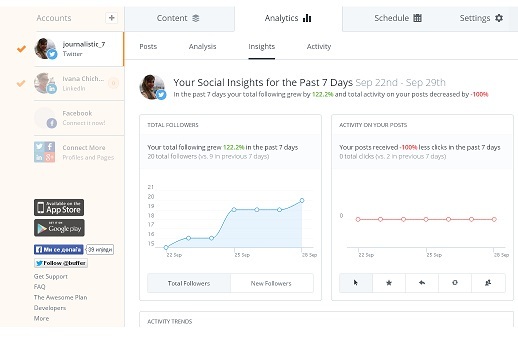 The Insights report gives you an overview of your total following growth and total activity on your posts for a selected period. Also, you can see when you got the newest followers in the period of 6 months presented in a graph form. The Insights report also shows which are your top posts. For example, in the previous 30 days that gained most Clicks, Retweets, Mentions, Favorites and had the Potential. Under each post, there is an option to re-buffer that content. Note: Here is what the Potential tab means: If you have 100 followers on Twitter when you tweet the update, your reach potential is 100. Now if someone retweeted your update, and they have 150 followers on their Twitter account, your potential becomes 250. The same applies to Facebook friends and LinkedIn connections. In Activity tab, you can see the engagement on your posts for given date. In fact, you can see how many Retweets, Favorites, Clicks, and Mentions your posts get on average. 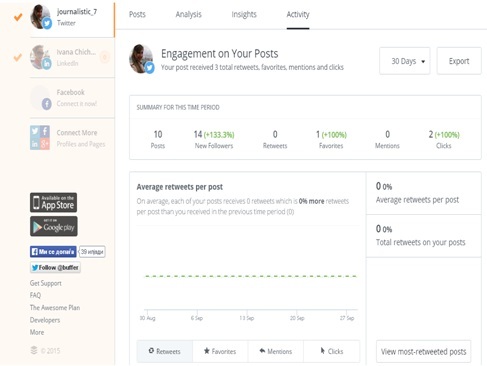 The Analytics tool enables you to see if you are making progress in your business with the social media updates. It gives you the feedback that helps you determine if you need a change and what that may be. Buffer offers wider possibilities with the further integration which includes the Browser extension and the Platform integration. You can install the Buffer extension and easily share everything you find it interesting or beneficial for your business. Go to My account- Browser extensions- click Install on the Setup window and you can share links, pictures, and videos from wherever you are on the web. You can repeat your post while scheduling is also possible with the Buffer extension. If you click on the Power Scheduler tab, you can schedule a post at certain intervals. For example, now, in 8 hours, in a day, in 7 days or add other time. If you want to be more active on Twitter, to buffer your power tweets, to draft tweets and then easily buffer them, to find the best time for tweeting, etc., go to the right side on the top of Buffer dashboard- click My account- choose Apps and extras. You may want to try some of these apps that are available for Twitter: Echofon, Tweetcaster, Followerwonk, Tweetings, Twylah, Tweet4me, and Tweriod. If you want to read news, web pages, and blogs, to share and track news, use some of these apps that easily connect with this platform: Feedly, Feeddler, RSSOwl, Mr. Reader, Reeder, News Mix and Instapaper. Pablo is the newest and coolest Buffer app for creating engaging images for your social media posts. WordPress and its sharing plugin Flare combined with Buffer, make it possible to buffer posts automatically published to your WordPress blog. The Buffer integration is a significant advantage. Whereas, with Browser Extension you can cover everything that catches your eye. Platforms integration gives you a broad range of your interests that you can quickly access all in one place. The Best thing for Buffer is that you can schedule content on social media. You can schedule updates whatever time you want- daily/weekly/monthly/yearly, from wherever you are and for different purposes. And of course, if you don’t know when is the best time to reach your target audience, try the Optimal Timing tool that shows you the best time for publishing a post. Buffer offers a great analytics so you can check for example the growth of your followers, setting the exact date that you are interested in. A very useful feature for business professionals and marketers is Analytics – Insights report – top posts that show you which of your posts have the most Retweets, Clicks, Favorites and Potential for whatever date you want to check. That is how you will estimate what works for you and what you should keep on posting. While Buffer is a great app, there are still some features that are missing. There are lots of social media sites that people use, but this platform doesn’t link with Instagram, Flickr, Youtube, Snapchat, Tumblr, Vine and many other popular social networking sites. Be also aware that you will still need to log in to your social media profiles to check notifications, people who sent you an invitation to friendship on Facebook and LinkedIn, new followers on Twitter, messages, etc. You can’t chat directly from the Buffer dashboard which is a serious disadvantage. Communication is the cornerstone of marketing, and it is a necessity to be successful in the digital age, so Buffer is of no benefit in this area. Buffer is useful for marketers who mostly want to schedule posts, i.e., to do push marketing. Even if you increase your reach, you can’t communicate with your clients through the Buffer dashboard. All in all, as post scheduler Buffer works perfectly, but don’t rely on it for conversation and engagement.